Natural Green Tourmaline Necklaces in 14k gold, and 925 sterling silver green tourmaline necklaces. 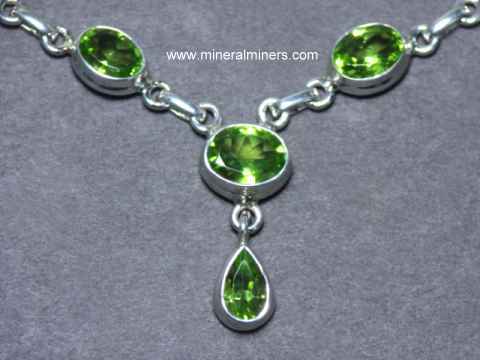 Try our Natural Color Green Tourmaline Necklace & Jewelry Satisfaction Guarantee - compare our prices and our superior quality. Click on any green tourmaline necklace to enlarge it. This unique green tourmaline necklace was handcrafted with open back settings in 925 sterling silver and bezel set with nine natural green tourmaline slices! 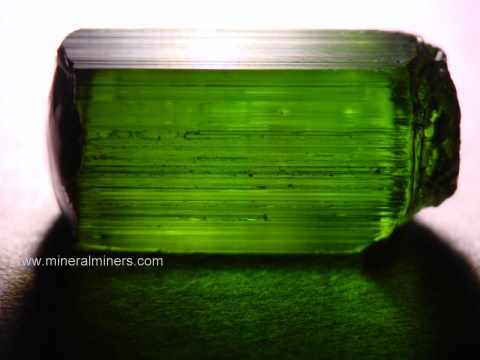 They are slices of green tourmaline pieces and crystal sections with natural medium green color and natural rough upper surfaces. See also a full view of this natural green tourmaline necklace. 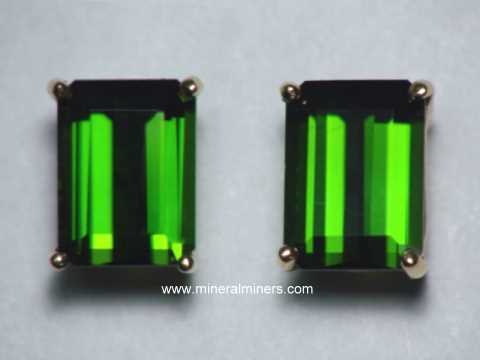 The green tourmalines were discovered in Minas Gerais, Brazil. They are unheated and untreated. Natural color tourmaline necklace with 80 carats of beads! Genuine tourmalines with natural color shades of pink, orange-brown, and light to dark green were polished into flat oval shape beads, and then drilled and strung in this 18 inch long (45cm) multi-color tourmaline necklace with a sterling silver clasp. There are 80 carats of natural color unheated tourmaline beads in this beautiful necklace! 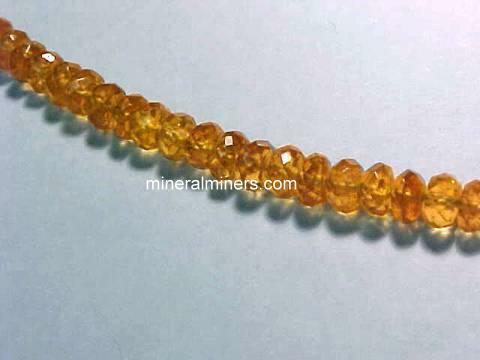 The lightly included beads are mostly transparent, and they average 7mm long. Natural color tourmaline necklace with 95 carats of transparent beads! 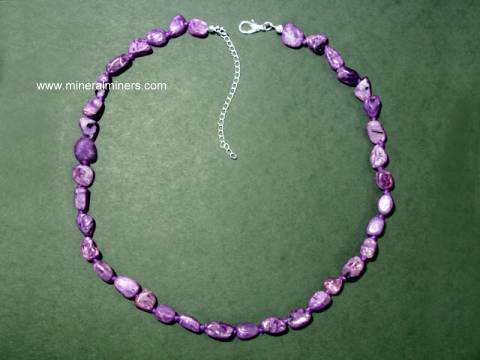 Genuine tourmalines with natural shades of pink, brown, and green were polished into flat oval shape beads, and then drilled and strung in this 18 inch long (45cm) multi-color tourmaline necklace with a sterling silver clasp. There are 95 carats of transparent natural color tourmaline beads in this wonderful necklace! 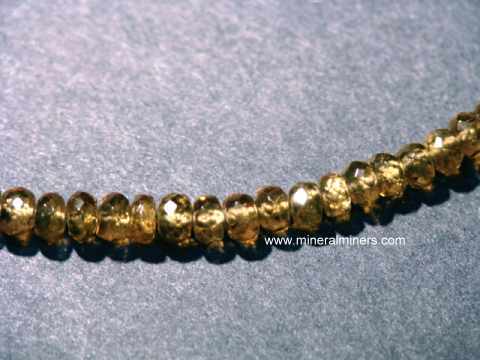 The photo at left shows a close-up view of these lightly included natural tourmaline beads. See also a full view photo of this natural tourmaline bead necklace. We also have other natural gemstone bead necklaces available: aquamarine necklaces, several qualities of emerald necklaces, large tanzanite necklaces, faceted ruby necklaces, large pink sapphire necklaces, transparent peridot necklaces, black spinel necklaces, faceted blue sapphire necklaces, and much more! Natural tourmaline necklace with 131 carats of transparent beads! 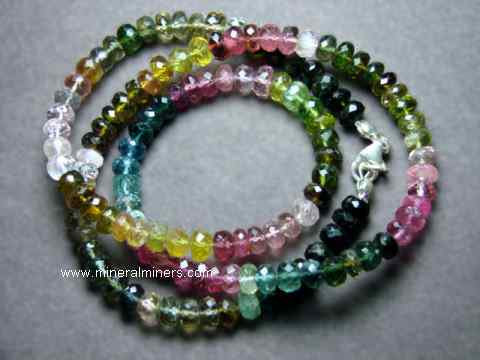 Genuine tourmalines with natural shades of pink, brown, blue and green were handground and polished into flat oval shape beads averaging about 10mm long, and then drilled and strung in this 18.5 inch long (47cm) multi-color tourmaline necklace with a sterling silver clasp. 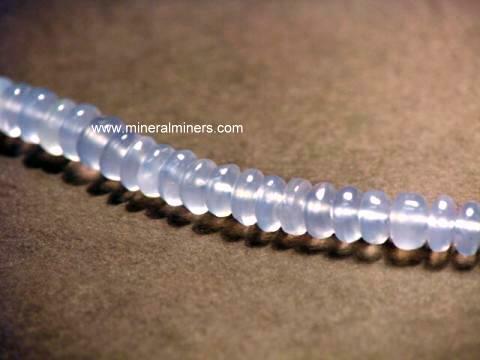 There are 131 carats of transparent natural color tourmaline beads in this wonderful necklace! 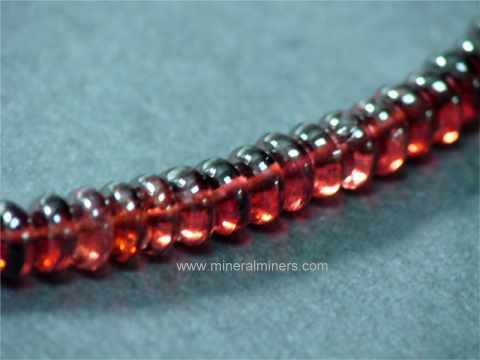 The photo at left shows a close-up view of these lightly included natural tourmaline beads. See also a full view photo of this natural tourmaline necklace. This natural color watermelon tourmaline necklace was handcrafted in 925 sterling silver and bezel set with nine lightly included tourmalines! 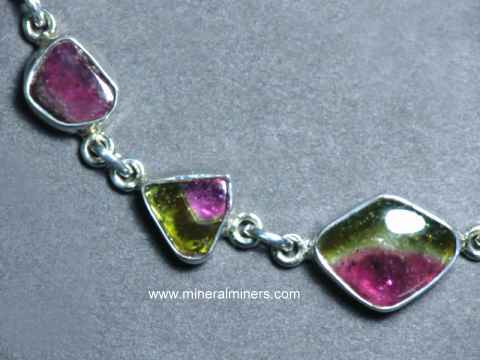 See a full view of this natural color watermelon tourmaline necklace. These natural color tourmalines are all unheated and untreated, and they are all transparent! See another close up view of the watermelon tourmaline gem slice in the center of this natural color watermelon tourmaline necklace. Two of the tourmalines in this unique necklace are pink, and the rest all have pink and green natural colors in the same tourmaline! There are two pink & green tourmaline (watermelon tourmaline) cabochon gems with faceted tops, two rough pink tourmaline pieces with very rich deep pink natural color, four polished slices of pink & green watermelon tourmaline, and a 17x15mm watermelon tourmaline polished slice in the middle of the necklace! 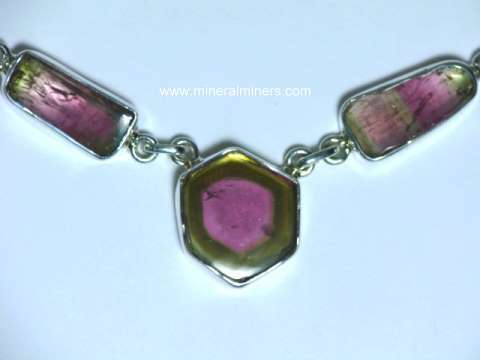 See another view of this natural color watermelon tourmaline necklace. This watermelon tourmaline necklace was handcrafted in 925 sterling silver and bezel set with nine lightly included tourmalines! 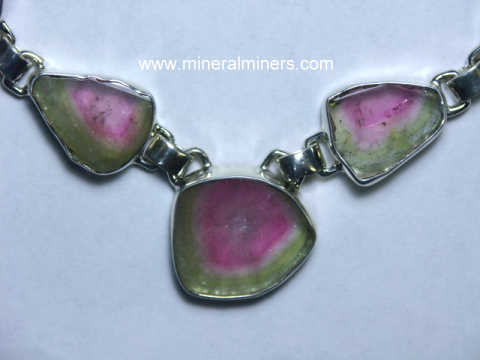 See a full view of this natural color watermelon tourmaline necklace. These natural color tourmalines are all unheated and untreated, and the tourmaline gems are all transparent. See another close up view of the tourmaline gems in this natural color watermelon tourmaline necklace. Four of the tourmalines in this unique necklace are pink, two are blue-green tourmaline hand-carved gems, and the rest have pink and green natural colors in the same tourmaline! There are two blue-green tourmaline hand-carved gems at the top on each side, then two rough pink tourmaline semi-transparent pieces with amazing deep pink natural color, then two pink & green tourmaline (watermelon tourmaline) polished slices, then two deep pink tourmaline cabochons with faceted tops, and a 21x20mm watermelon tourmaline polished slice in the middle of the necklace! 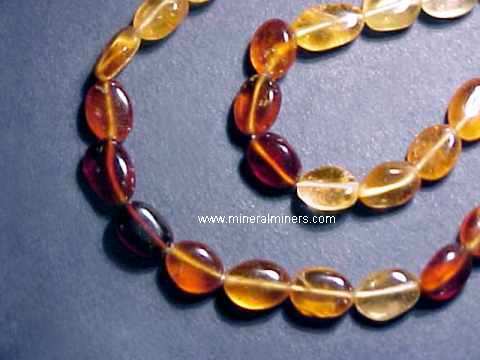 See another view of this natural color watermelon tourmaline necklace. This one-of-a-kind tourmaline necklace was handcrafted in 925 sterling silver and bezel set with open backs under seven lightly included tourmaline gem slices! The extra large size center stone shown in the close-up photo at left is an amazing 40x28mm thin polished slice of banded pink and green natural color tourmaline. See another view showing all of the gems in this spectacular tourmaline necklace. See also a full view of this unique and beautiful tourmaline necklace. These natural color tourmalines are all unheated and untreated, and they are all semi-transparent to transparent. With a little imagination, the large centerstone tourmaline slice shows an uncanny resemblance to a "sunrise"... See a close-up view of this natural color tourmaline sunrise! 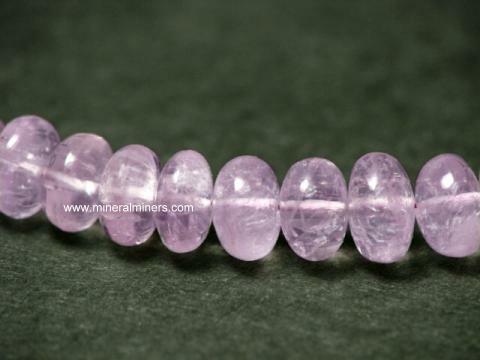 The remaining six gems are bi-color pink with green tourmaline gem slices measuring from 15x9mm up to 25x16mm. These bi-color tourmaline gem slices were all handcrafted from natural color watermelon tourmaline crystals. Natural color tourmaline crystal sections that were found in Brazil were bezel set and mounted in this unique 925 sterling silver tourmaline crystal necklace. The center tourmaline has dark blue-green natural color, and it is set on each side by a pink tourmaline crystal section as shown in the photo at left. 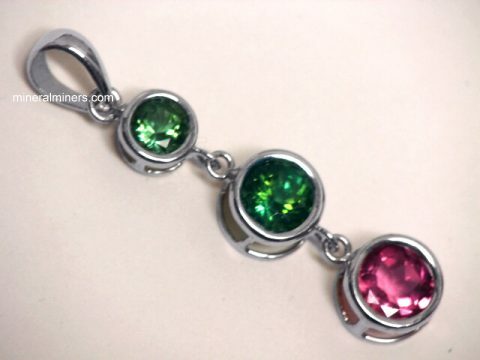 The pink tourmalines are followed by a medium blue tourmaline crystal section on each side and then finally a dark green tourmaline crystal section is bezel set on each side up above the others. There are nine natural color tourmaline crystals total. The three darker crystals appear black except when held near a light. These are all natural color tourmalines, and they measure 1/3 inch long and are semi-transparent to transparent. The photo at left shows a close up view of the center crystals held near a light. 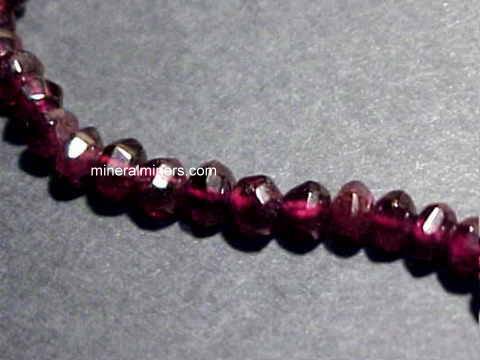 See another close-up view of this natural tourmaline necklace. See also a full-view image of this unique tourmaline crystal necklace. This 1.1 inch long pear shape green tourmaline pendant is bezel set in solid 14k white gold with an open back setting. 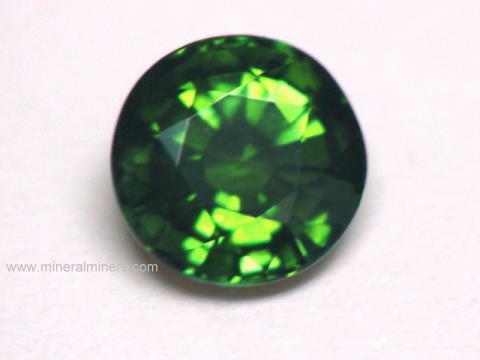 The cabochon tourmaline gem has medium-dark green natural color. This superior quality cabochon gem is only very lightly included, with some faintly visible natural inclusions inside. 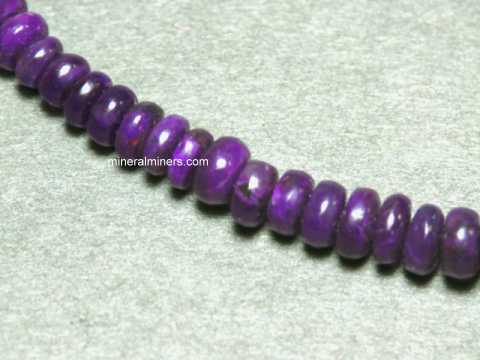 This natural tourmaline gem is unheated and untreated. This one inch long pear shape green tourmaline pendant is prong set in solid 14k white gold with an open back setting under the gem. 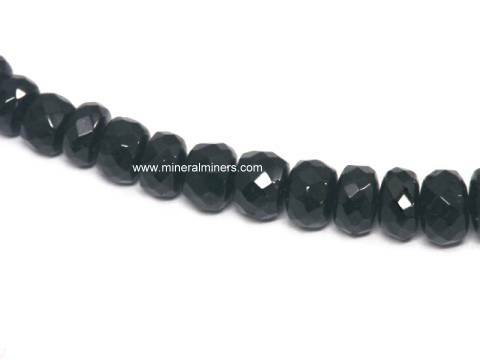 The faceted tourmaline gem has dark green natural color. This fine quality gemstone is totally clean even when examined with magnification! 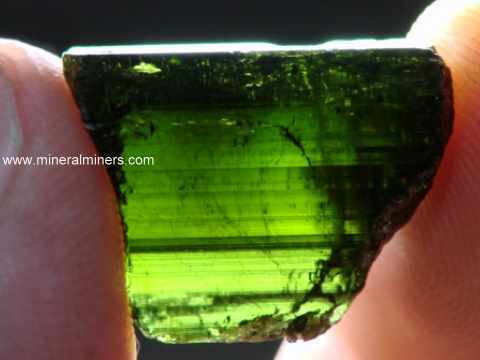 This beautiful green tourmaline gem is unheated and untreated. See another view of this natural color green tourmaline 14k gold pendant. This unique pendant is set in solid 14k white gold with a rare collector quality pleochroic tourmaline gemstone. This 9.5mm round brilliant cut tourmaline has excellent brilliance, and this fine quality collector gem is completely clean even with magnification! This amazing pleochroic tourmaline gem has medium green natural color in one direction, and it has medium-dark brown natural color at 90 degrees. This fine quality gem was carefully oriented by the gem-cutter to show both colors at once when the gem is facing up as shown at left. The colors mix and blend wonderfully as you turn the gem. This genuine pleochroic tourmaline gem is unheated and untreated. See a view along the green color direction of this natural pleochroic green tourmaline pendant. See also a view along the brown color direction of this natural color pleochroic tourmaline pendant. This 6x4mm octagon shape green tourmaline pendant is set in solid 14k yellow gold. The small faceted tourmaline gem has dark green natural color with blue-green hues. This fine quality gem is completely clean, even under very close inspection. 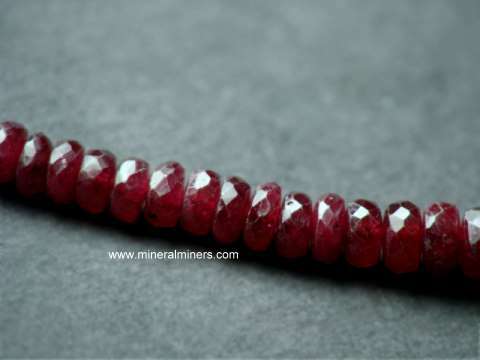 This natural tourmaline gem is unheated and untreated. This green tourmaline pendant is set in solid 14k yellow gold with an eye clean square faceted tourmaline gemstone with rich green natural color: this natural tourmaline gem is unheated and untreated. This 6mm heart shape green tourmaline pendant is set in solid 14k yellow gold. 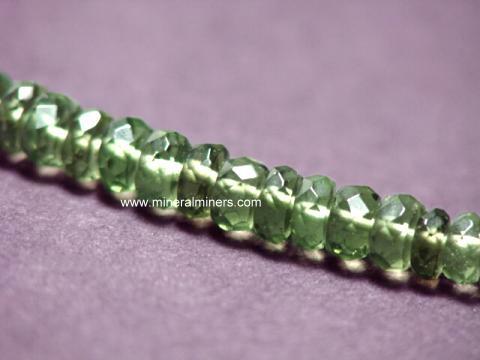 The small faceted tourmaline gem has dark green natural color with blue-green hues. This fine quality gem is completely clean, even under very close inspection. 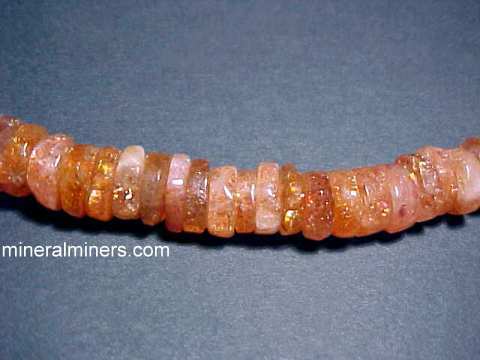 This natural tourmaline gem is unheated and untreated. This 6mm heart shape green tourmaline pendant is set in solid 14k yellow gold with a faceted tourmaline gemstone with fine mint green natural color. 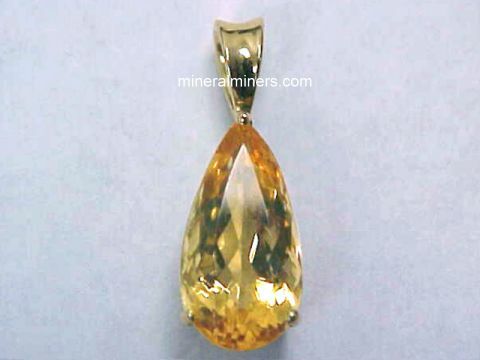 This beautiful gem faces up clean, with faint natural inclusions visible only under close inspection. 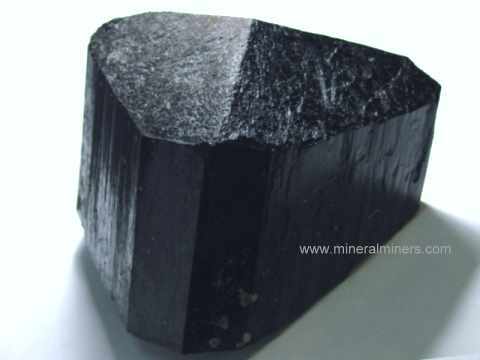 This natural tourmaline gem is unheated and untreated. This solid 14k white gold pendant is set with a rare quality green tourmaline gemstone with very fine medium green natural color - this wonderful gem is unheated and untreated. The 1.66 carat tourmaline gem in this pendant is completely eye clean. This beautiful tourmaline gem was very well cut from a natural green tourmaline crystal that was mined in Minas Gerais, Brazil. See also a side view of this natural green tourmaline 14k gold pendant. This natural green tourmaline jewelry design was handcrafted in solid 14k yellow gold and set with a 14mm long rectangular cut green tourmaline gemstone with beautiful deep green natural color. 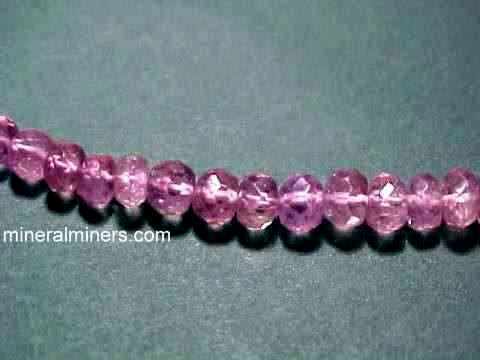 This fine quality tourmaline gem is completely clean even under close inspection, and it is unheated and untreated. This beautiful gem was faceted from a natural green tourmaline crystal that was mined in Minas Gerais, Brazil. This natural green tourmaline jewelry design was handcrafted in solid 14k yellow gold and set with a 19mm long rectangular cut green tourmaline gemstone with beautiful dark green natural color - this tourmaline gem is unheated and untreated. This fine quality tourmaline gem is completely clean even under close inspection with magnification (GIA: Type I Gem, Clarity Grade: flawless). This wonderful gem is very well faceted with good brilliance from a natural green tourmaline crystal that was mined in Minas Gerais, Brazil. See a side view of this large green tourmaline pendant. This natural green tourmaline jewelry design was handcrafted in solid 14k yellow gold and set with a 10mm long rectangular cut green tourmaline gemstone with very fine medium-dark green color with slightly blue-green tones (100% natural color - this gem is unheated and untreated). This fine quality tourmaline gem is completely clean even with magnification (GIA: Type I Gem, Clarity Grade: VVS). This beautiful gem was very well faceted with good brilliance from a natural green tourmaline crystal that was mined in Minas Gerais, Brazil. 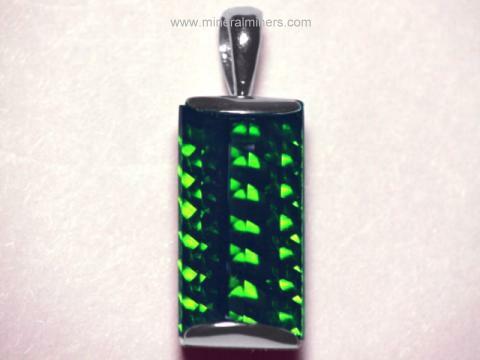 See a different view of this very fine green tourmaline pendant. See also another view of this natural color green tourmaline jewelry design. This natural green tourmaline jewelry design was handcrafted in solid 14k white gold and set with an 11x6.5mm pear shape green tourmaline gemstone with medium green color (100% natural color - this gem is unheated and untreated). This lightly included tourmaline gem faces up eye clean, with faint natural inclusions visible under close inspection (GIA: Type I Gem, Clarity Grade: VS/SI). This beautiful gem is well cut with good brilliance from a natural green tourmaline crystal that was mined in Minas Gerais, Brazil. See a different view of this natural color green tourmaline pendant. See also a side view of this natural color green tourmaline jewelry design. This unique 14k white gold pendant has 2.45 grams of solid 14k gold! It is set with a genuine green tourmaline gemstone with fine medium green natural color - this superior quality gem is unheated and untreated. 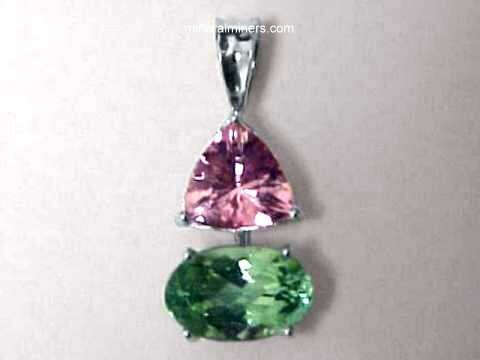 The 8.58 carat tourmaline gem in this pendant is completely clean even under very close inspection! This beautiful tourmaline gem was handcrafted from a natural green tourmaline crystal that was mined in Minas Gerais, Brazil. See another view of this natural green tourmaline 14k gold pendant. See also a side view of this unique green tourmaline 14k gold jewelry design. 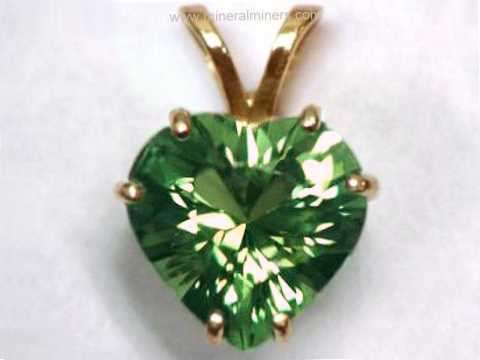 This unique pendant is set in solid 14k yellow gold with a beautiful heart shaped green tourmaline gemstone with fine medium green natural color. 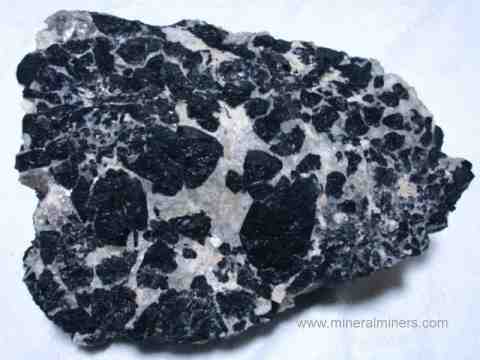 This beautiful gem is unheated and untreated. See also a side view of this natural color green tourmaline pendant. This fine quality gem of natural color tourmaline faces up completely clean! 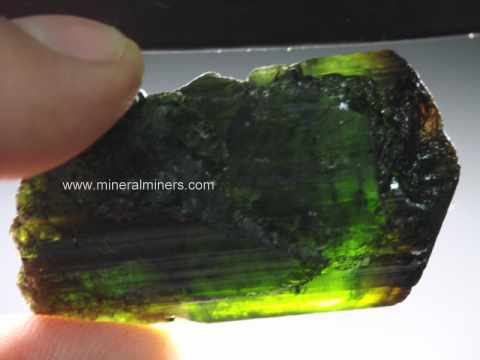 It is very well faceted in a heart shape with very good brilliance from a natural green tourmaline crystal that was mined in Minas Gerais, Brazil. This solid 14k white gold pendant is set with a fine quality round brilliant cut green tourmaline gemstone with fine medium mint green color (100% natural color - this tourmaline gem is unheated and untreated). This round brilliant cut tourmaline gem is completely eye clean (GIA: Type I, Clarity Grade: VVS), and it is exceptionally well faceted with wonderful brilliance in a round brilliant diamond cut from a natural green tourmaline crystal that was mined in Minas Gerais, Brazil. This 14k yellow gold pendant is set with a natural green tourmaline gemstone with fine medium green color (100% natural color - this gem is unheated and untreated). This fine quality tourmaline gem is completely clean even under very close inspection (GIA: Type I, Clarity Grade: VVS), and it has superb cutting and brilliance! 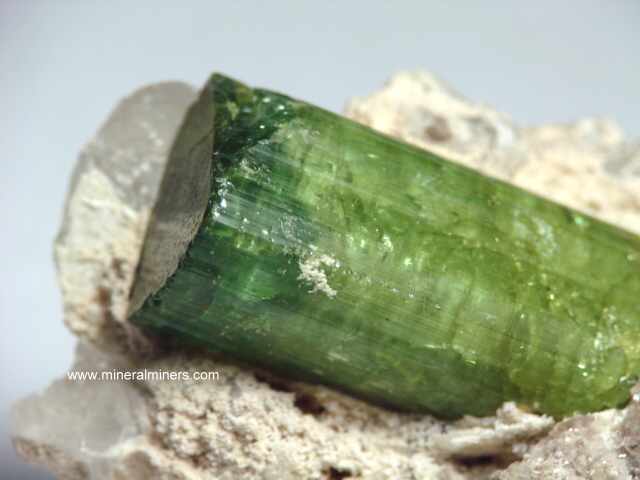 It was faceted from a natural green tourmaline crystal that was mined in Minas Gerais, Brazil. This solid 14k yellow gold pendant is set with a fine quality round cut green tourmaline gemstone. This beautiful gem has medium-dark green color with slightly blue-green hues (100% natural color - this natural tourmaline gem has not been heated or treated in any way). This round cut tourmaline gem is completely clean to the eye (GIA: Type I, Clarity Grade: VVS). 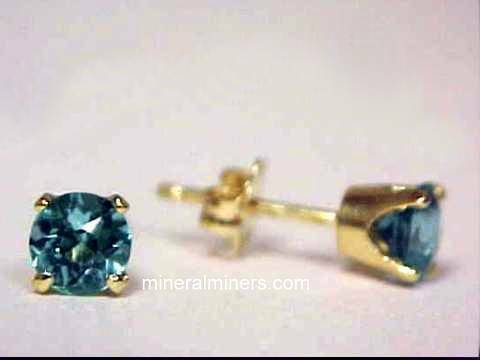 It is very well faceted with very good brilliance from a natural blue-green tourmaline crystal that was mined in Minas Gerais, Brazil. This natural green tourmaline jewelry pendant was handcrafted in solid 14k yellow gold and set with a natural color green tourmaline gem measuring 13mm long x 5.5mm wide and weighing 3.1 carats. 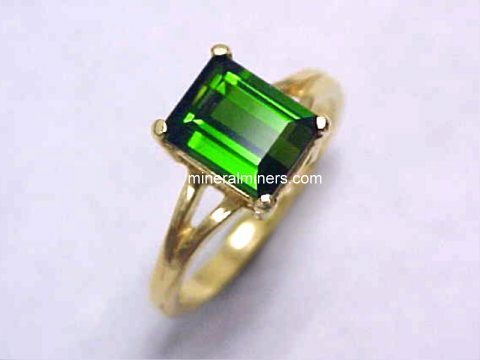 This wonderful tourmaline gemstone has fine deep green natural color - this tourmaline gem is unheated and untreated. This beautiful tourmaline is very well faceted in a roll-top baguette cut with concave facets on the backside giving this beautiful gem truly amazing brilliance! This deep green tourmaline gem faces up completely eye clean, and under close inspection with bright illumination it has a faint natural inclusion (GIA: Type I, Clarity Grade: VS). See also a side view of this fine green tourmaline jewelry design. This large size 14k gold pendant was handcrafted in a solid 14k yellow gold setting weighing 1.95 grams. 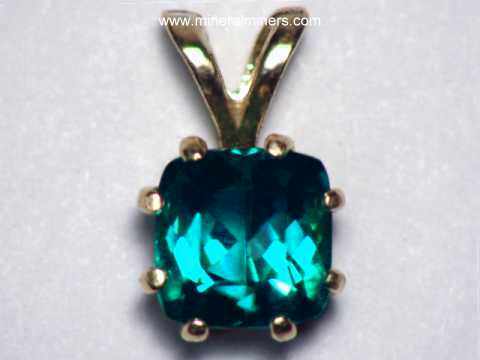 This beautiful pendant is set with a 7.00 carat green trending to blue-green tourmaline gemstone! This fine quality tourmaline gem is totally clean even under magnification. It was faceted from a natural tourmaline crystal that was mined in Minas Gerais, Brazil. 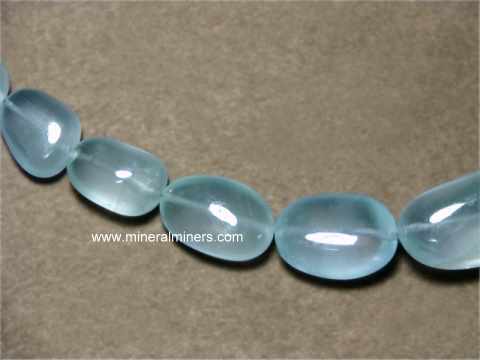 This gem has fine medium dark green to blue-green 100% natural color - this tourmaline gem is unheated and untreated. See also a side view of this solid 14k gold natural green tourmaline jewelry pendant. 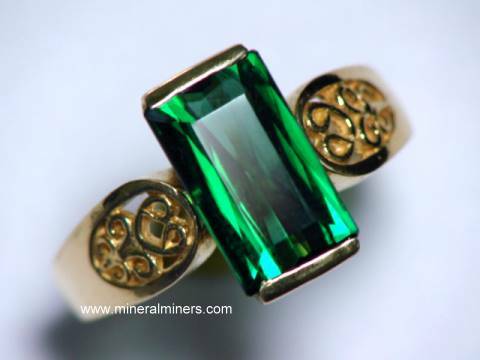 See also a top view of this solid 14k gold natural green tourmaline jewelry design. This solid 14k yellow gold pendant is set with a green tourmaline gemstone with dark green natural color - this gem is unheated and untreated. 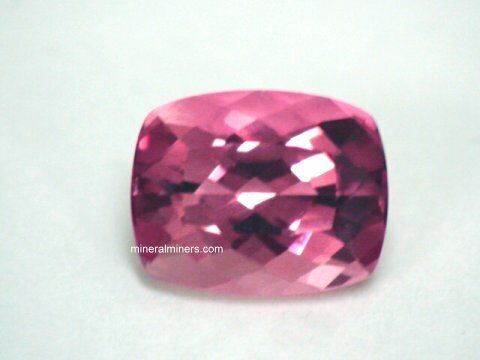 This beautiful tourmaline gemstone is very well cut with good brilliance. It faces up very nicely, with faint natural inclusions visible under close inspection. This natural tourmaline gem was very well faceted in an oval cut from a natural green tourmaline crystal that was mined in Minas Gerais, Brazil. This nice size 14k gold pendant was handcrafted in a solid 14k yellow gold setting weighing 2.03 grams in total weight. This beautiful pendant is set with a 3.50 carat bright green tourmaline gemstone. This fine quality tourmaline gem is totally clean to the un-aided eye. It was faceted from a natural tourmaline crystal that was mined in Minas Gerais, Brazil. 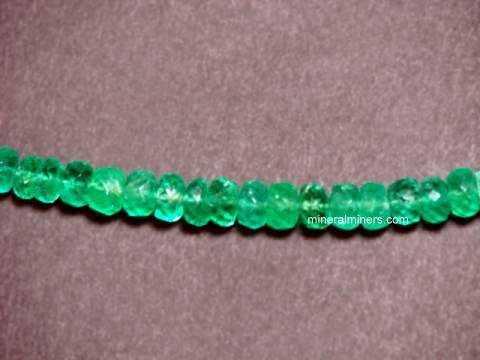 This gem has fine medium green 100% natural color - this tourmaline gem is unheated and untreated. See also another view of this solid 14k gold natural green tourmaline jewelry pendant. This solid 14k gold pendant is set with three fine quality green tourmaline gemstones with very beautiful medium green color (100% natural color - they are unheated and untreated). 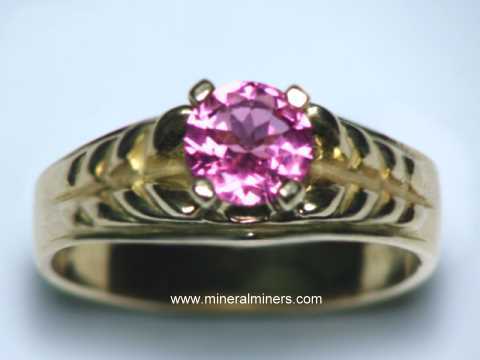 These three natural tourmaline gems face up clean, and they are very well cut with good brilliance. They were faceted from natural green tourmaline crystals that were mined in Minas Gerais, Brazil. This solid 14k yellow gold pendant is set with a fine quality genuine green tourmaline gemstone with medium dark green natural color - this superior quality gem is unheated and untreated. The 1.16 carat tourmaline gem in this pendant is completely clean even under close inspection with magnification (flawless)! This beautiful tourmaline gem was faceted from a natural green tourmaline crystal that was mined in Minas Gerais, Brazil. See a side view of this natural green tourmaline 14k gold pendant. This 14k yellow gold pendant is set with a genuine green tourmaline gemstone with rich dark green color (100% natural color - this gem is unheated and untreated). This 2.96 carat octagon cut tourmaline gem is was very well faceted from a natural dark green tourmaline crystal that was found in Minas Gerais, Brazil. This fine quality green tourmaline gemstone is completely clean even under close inspection! This solid 14k gold pendant is set with a fine quality genuine green tourmaline gemstone with very dark green natural color - this superior quality gem is unheated and untreated. 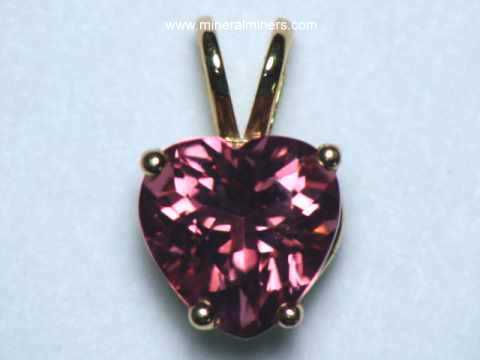 The 3.95 carat tourmaline gem in this pendant is completely clean even under close inspection with magnification (flawless)! This beautiful tourmaline gem is so dark that it appears almost black under some lights with deep green colors in its depths. This gem was faceted from a natural green tourmaline crystal that was mined in Minas Gerais, Brazil. See a side view of this natural green tourmaline 14k gold pendant. See also another view of this wonderful dark green tourmaline pendant. This solid gold pendant is set with a fine quality genuine green tourmaline gemstone with dark green natural color - it is unheated and untreated. See another view of this green tourmaline white gold jewelry design. 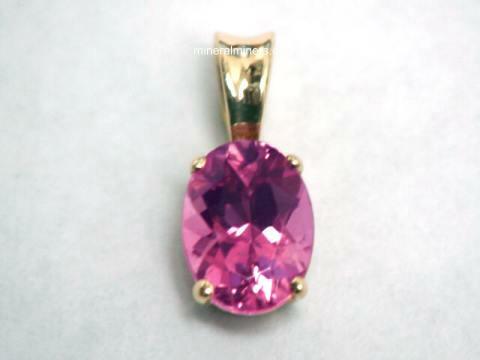 The 5.07 carat tourmaline gem in this pendant is completely clean even under close inspection! This beautiful tourmaline gem was very well cut from a natural green tourmaline crystal that was mined in Minas Gerais, Brazil. See also a side view of this natural color green tourmaline white gold pendant. This solid 14k yellow gold pendant is set with a beautiful green tourmaline gemstone with fine dark green natural color - this wonderful gem is unheated and untreated. The 5.21 carat tourmaline gem in this pendant is completely eye clean. This beautiful tourmaline gem was very well cut from a natural green tourmaline crystal that was mined in Minas Gerais, Brazil. See also a side view of this natural green tourmaline 14k gold pendant. 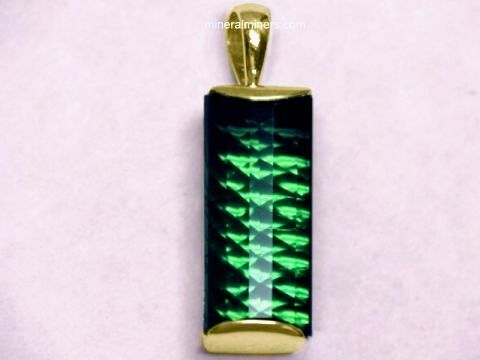 This beautiful pendant was handcrafted in solid 14k yellow gold and set with a 15mm long triangular cut green tourmaline gemstone with rich, deep green color (100% natural color). The faceted green tourmaline gemstone in this pendant weighs 3.2 carats! It was faceted from a natural green tourmaline crystal that was mined in Minas Gerais, Brazil. This pendant was handcrafted in solid 14k yellow gold and set with a bright, medium green, cushion shaped tourmaline, faceted gemstone with 100% natural color. 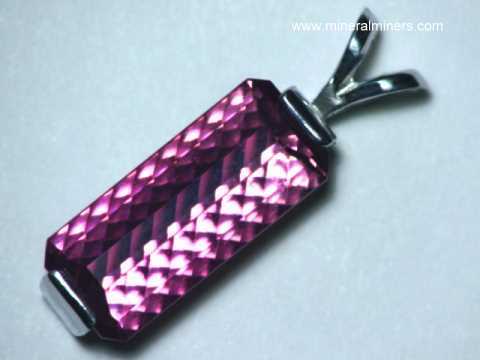 The tourmaline gem in this pendant weighs 3.96 carats and measures 10.7 X 8.7mm. The tourmaline gem was fashioned in Pakistan. 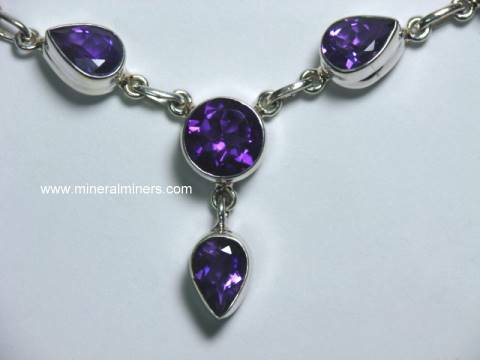 It is a beautiful gemstone but with close inspection does contain an eye visible flaw on the keel of the gem. Our "Special price" on this tourmaline pendant is $387.50. This heavy ring was handcrafted in solid 14k yellow gold and set with a bright, slightly blueish green oval shaped, transparent, tourmaline cabochon gemstone with 100% natural color. The transparent cabochon cut tourmaline gem in the center of this ring is completely loupe clean, weighs 2.25 carats, and measures 8.9 X 6.9mm. This tourmaline gem was fashioned in the U. S. from a Brazilian tourmaline crystal. The ring is size 6 1/2. This unique pendant was handcrafted in 925 sterling silver and set with an 11mm long natural color dark green tourmaline crystal section and with a natural color 5mm round blue-flash moonstone gem. The green tourmaline crystal is so dark that it appears almost black, however when back-lit the beautiful green natural color is visible. See a back-lit view of this green tourmaline crystal pendant. The green tourmaline crystal was discovered in Minas Gerais, Brazil, and the moonstone was discovered in India. Both gems are unheated and untreated. This genuine tourmaline crystal pendant was handcrafted in 925 sterling silver and set with an 1.1 inch long natural color dark green tourmaline crystal. The green tourmaline crystal is so dark that it appears black, however when back-lit the beautiful green natural color is visible. See a back-lit view of this green tourmaline crystal pendant. The green tourmaline crystal was discovered in Minas Gerais, Brazil. It is unheated and untreated. This pendant was handcrafted in sterling silver and set with two natural color green tourmaline crystal sections and with a 3mm round faceted natural color pink tourmaline gemstone. This beautiful pendant is also set at the top with a freshwater pearl. 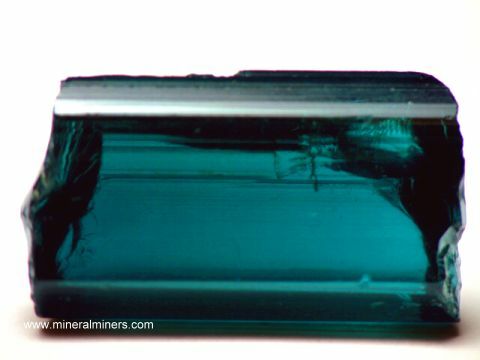 The tourmalines were mined in Minas Gerais, Brazil. 18 carats total weight tourmaline cabochon gems! This large size pendant was handcrafted in 925 sterling silver and set with two lightly included cabochon gems of rich golden green color tourmaline (100% natural color; unheated and untreated). The tourmaline gems in this pendant measure 10mm round and 16x12mm oval, and they weigh a total of 18 carats! 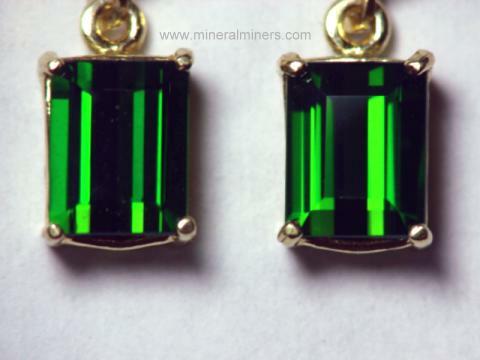 They were ground & polished from a natural green tourmaline crystal that was mined in Minas Gerais, Brazil. This solid 14k yellow gold pendant is set with a natural tourmaline gemstone, and with a 4mm round faceted natural white zircon gemstone! 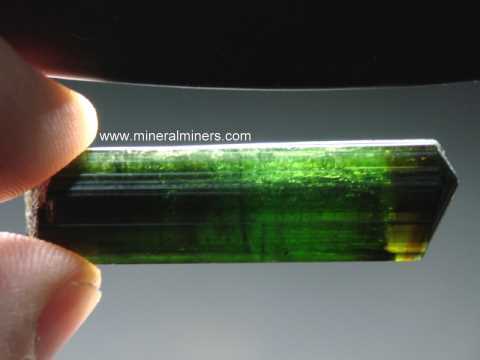 The beautiful tourmaline gem has fine medium green natural color at one end which grades into fine medium blue-green towards the opposite end - it is unheated and untreated. This fine quality bi-color tourmaline gem faces up eye clean (GIA: Type I, Clarity Grade: VS) which is very rare natural bi-color tourmaline gemstones. This beautiful gem is very well faceted in a roll top baguette cut with concave facets on the back side giving the gem amazing life and superb brilliance! See also a side view of this natural color blue-green tourmaline pendant. Our Green Tourmaline Necklaces are all set with natural color green tourmaline gems! 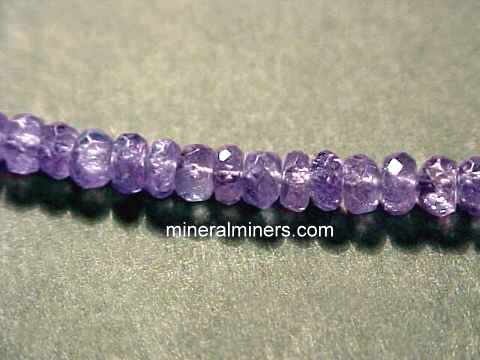 See also our blue tourmaline jewelry. Did you know that green tourmaline necklaces are a traditional birthstone jewelry gift choice for birthdays in the month of October? We have a large variety of tourmaline necklace styles available with all natural color tourmaline gemstones in many other colors including blue, pink and sunset color tourmalines. Be sure to see all of our genuine tourmaline Jewelry! 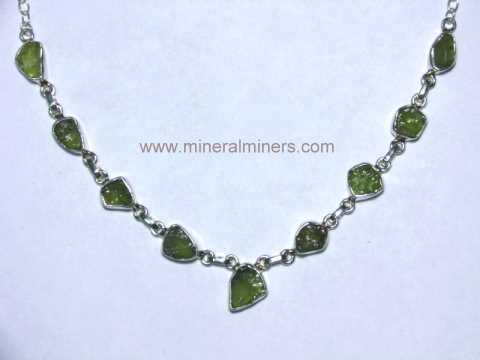 See also our large selection of other genuine green tourmaline jewelry designs. 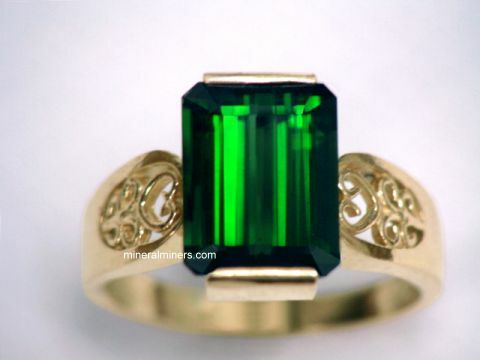 We have all natural green tourmaline gemstones set into handcrafted green tourmaline rings in solid 14k gold and also in pure 925 sterling silver. We also have a large selection as well of green tourmaline necklaces & pendants in unusual shapes and sizes that are set in unique styles. Our green tourmaline rings are all unique one-of-a-kind designs. We have green tourmaline earrings in both leverbacks and stud earrings available in a wide selection of green tourmaline gemstone sizes with shades of natural color green ranging from light mint greens to deep green tourmaline gems. Our genuine green tourmaline pendants and necklaces are available with a variety of green tourmaline gemstone shapes including rounds, ovals, pear shapes, and rectangular shaped green tourmaline gems. Each of our green tourmaline necklaces is set with natural color untreated green tourmaline gemstones that were mined in Brazil, Africa, or Madagascar. 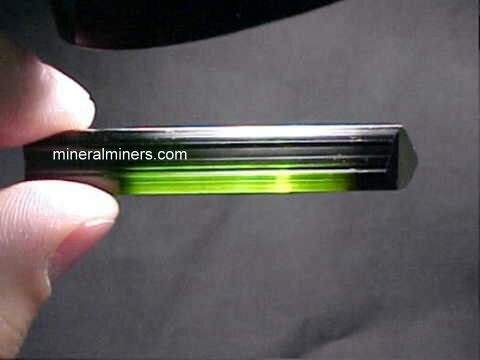 Here at mineralminers.com, we do not have any lab-created green tourmalines, and we do not have any diffusion treated or heat treated green tourmalines! We specialize in genuine natural color green tourmaline necklaces that were faceted from natural green tourmaline crystals. Most of our green tourmaline necklaces are set in solid 14k gold, and we also have 925 sterling silver green tourmaline necklace designs. We have natural green tourmaline necklaces available in beautiful shades of light green to dark green tourmaline with all natural colors. We have a large selection of sizes and shapes available as well in fine green tourmaline rings. See also our selection of natural color green tourmaline crystals. 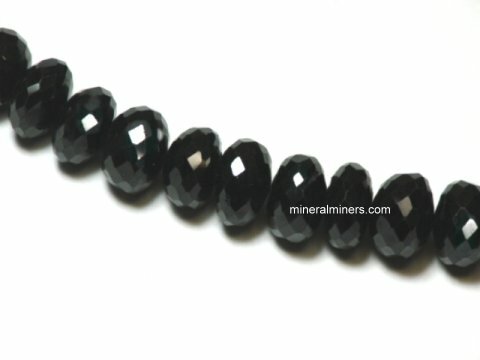 See our page displaying black tourmaline necklaces. 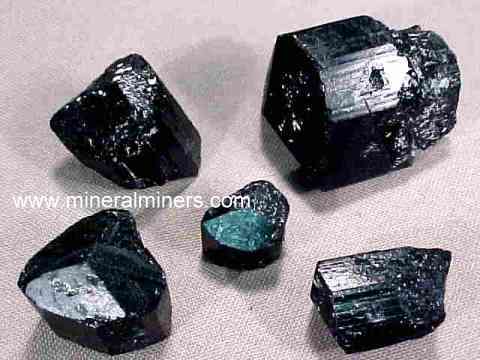 See also our page displaying all of our genuine black tourmaline products. Would you like us to inform you when we add on this page more natural color green tourmaline necklaces set in 14k gold in both white gold and yellow gold? We do have additional inventory of natural color green tourmaline necklaces in stock, so be sure to let us know if you have any green tourmaline necklace special requests. Be sure to see all of our genuine tourmaline products! 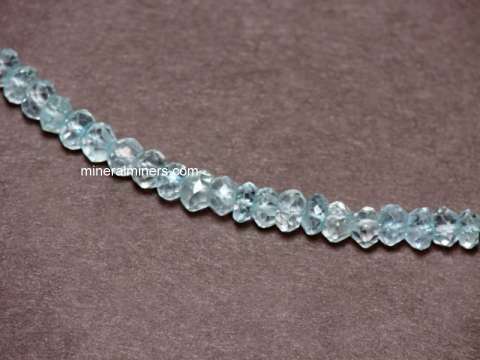 We have been mining for aquamarine, topaz, kunzite, tourmaline & other gems for more than 30 years. We have a large variety of natural gemstone necklaces available with many different kinds of natural gemstones. Our natural color aquamarine necklaces are available with many different aquamarine gemstone shapes and sizes to choose from. 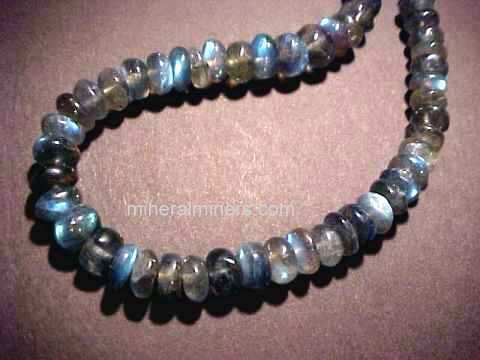 We also have pages displaying natural color amethyst necklaces & lapis lazuli necklaces, and genuine citrine necklaces, as well as our natural opal necklaces. 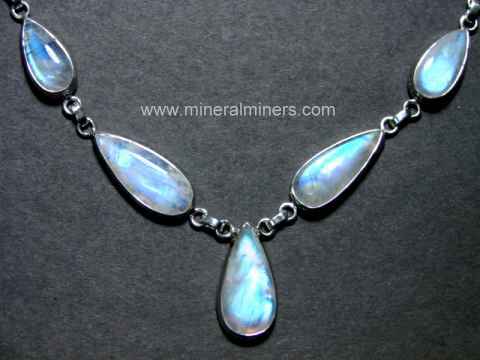 We have other natural opal jewelry items including natural Australian boulder opal necklaces and natural Ethiopian opal necklaces. See our selection of genuine ruby necklaces set with natural rubies mined in Mozambique. We have a large selection of genuine freshwater pearl jewelry designs and pearl necklaces as well, and we have a large selection of sizes available in high quality sugilite necklaces! Be sure to see our natural gemstone jewelry pages displaying aquamarine jewelry including genuine aquamarine necklaces in both 14k gold and in sterling silver. We also have genuine emerald necklaces, garnet necklaces, peridot necklaces and moonstone necklaces, all set with 100% natural gemstones. 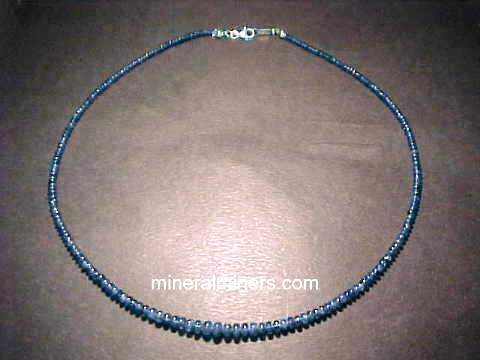 We have genuine sapphire necklaces available with real sapphires in many of the natural sapphire colors including genuine blue sapphire necklaces. 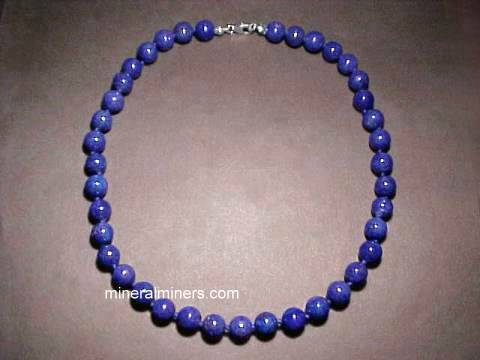 Be sure to also see genuine tanzanite necklaces set in solid gold. We have a large variety of genuine tourmaline necklaces in beautiful all natural shades of green, pink, and blue tourmaline. 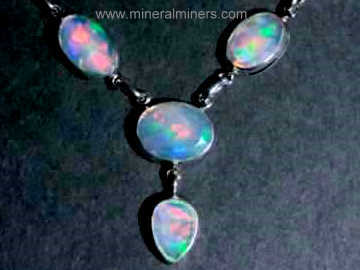 Be sure to see our pages displaying genuine opal necklaces, and our genuine color change alexandrite necklaces. Please contact our webmaster or our 'site' geologist with any questions or comments regarding our natural color green tourmaline necklaces.